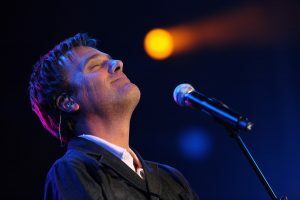 Michael W. Smith has written hits such as “Awesome God,” “Place in This World,” and “Healing Rain,” throughout his time in gospel and inspirational music. He has helped millions of people celebrate their faith through music and continues to create inspiring and beautiful songs of worship for everyone around the world. His music has won many awards during his career because of its inspirational messages and simplicity. Smith has earned 32 number one songs, multi-platinum, platinum, and gold-certified albums, as well as three Grammys and one American Music award. As if that’s not enough, he has 45 Dove Awards to go with all of these accolades. Smith was born on October 7, 1957 in Kenova, West Virginia. He developed his love for music when playing the drums in church as a child. As he grew within the church’s community he began to hone his voice and musical skills. Once he graduated from high school he searched for a place to take his music and after a short time in college he began playing in small bands around Nashville. After having some issues with alcohol, Smith returned to the flock and began playing with a band named Higher Ground. With that, he began writing for gospel singers such as Sandi Patty, Kathy Troccoli, and Bill Gaither, which helped him learn about the industry and get his voice to the masses. With his first solo album, “Go West Young Man,” Smith skyrocketed into popularity and, well, the rest is history. Feliz has been opening for Smith during their current tour together. Jordan Feliz is a Dove Award Winning New Artist of the Year that has two hit singles under his belt. His first solo project, Beloved, has his hits, “The River” and “Never Too Far Gone,” which have become wildly popular among inspirational and gospel fans. Feliz himself focuses on folk rock and Christian pop and is excited to work on his next project. Tasker will be a special guest during this show. Nathan Tasker is originally from Australia and is an acoustic singer and songwriter. He is best known for his phenomenal guitar skills and was the 2011 Australian Artist of the Year.